The Tiara 4300 Open offers the luxury of space and comfort for whatever water adventure boaters want to pursue. With a lower cockpit area of 84 square feet, and an additional 83 square feet on the step-up command deck, the 4300 Open has the largest social area in its size class. The spacious interior is an awesome living environment, highlighted by an open floor plan and head room that starts at 6 feet, 10 inches and is never less than 6 feet, 2 inches. The 4300 Open is a powerful, smooth and dry-riding yacht with a 15-foot, 2-inch beam and, with twin 6V92 Detroit Diesel engines, you can feel the power at the helm. The 4300 Tiara Open is entered through the cockpit which is large enough for fishing and comfortable for cruising. The aft seat folds down at the transom and faces an aft bench seat. Up a few steps is the helm area covered with a fiberglass hard top and curtain enclosure. 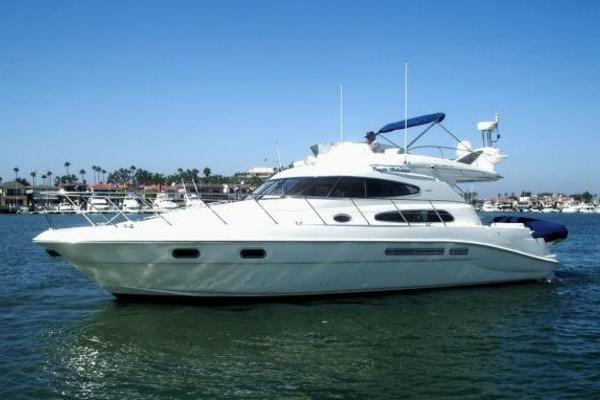 On the port side is an L-shaped lounge and starboard is a single helm seat and wet bar. A plexiglass sliding door leads below where the galley is portside and the head & shower starboard. Forward of the galley is a convertible lounge adjacent to a U-shaped dinette that converts to a double berth. All of the way forward is the Master Stateroom that features a raised island berth with storage beneath. L-shaped lounge on port side with storage drawers. Converts to over/under berth. U-shaped dinette with table. Converts to double berth.